Brittany and James’ downtown St. Pete wedding featured an outdoor wedding ceremony, followed by a classic ballroom reception. “Most of my family lives in the St. Petersburg area and James is from Michigan, so we wanted to give his family and friends a reason to escape the cold for a few days and enjoy the sunny Florida weather,” the bride shared. The South Carolina couple chose a refined, timeless theme and color palette. Since the bride and groom had a large amount of out-of-town guests, it was important to choose a St. Petersburg wedding venue that could accommodate the ceremony, reception and accommodations..
To capture their destination Florida wedding, Brittany and James searched for a St. Petersburg wedding photographer who was professional and had a defined approach. 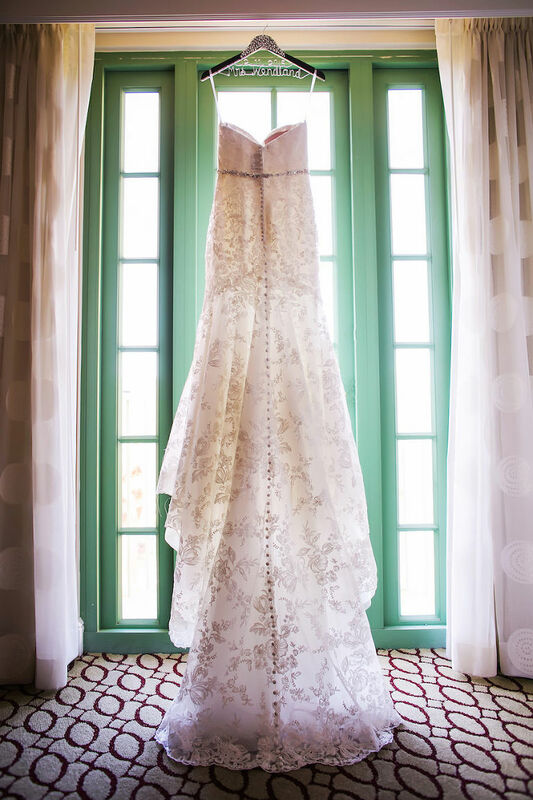 “We hired Limelight Photography because we love their style. Rebecca and Michael [of Limelight Photography] did a great job capturing the candid style photos we wanted, while seamlessly blending into the crowd during our ceremony and reception. We were thrilled with how our wedding photos turned out and so happy we chose them!” the bride gushed. Looking back, one of Brittany’s most memorable moments came during the wedding ceremony. “One of my favorites was our sand ceremony. We combined sand from our hometowns of Harbor Springs, Michigan and Sarasota, Florida, as well as our current home of Charleston, South Carolina. Not only did the different colors and textures of the sand look beautiful, but it was also a nice way to incorporate our favorite places into our wedding,” the bride reminisced. What was your wedding stationery inspiration? 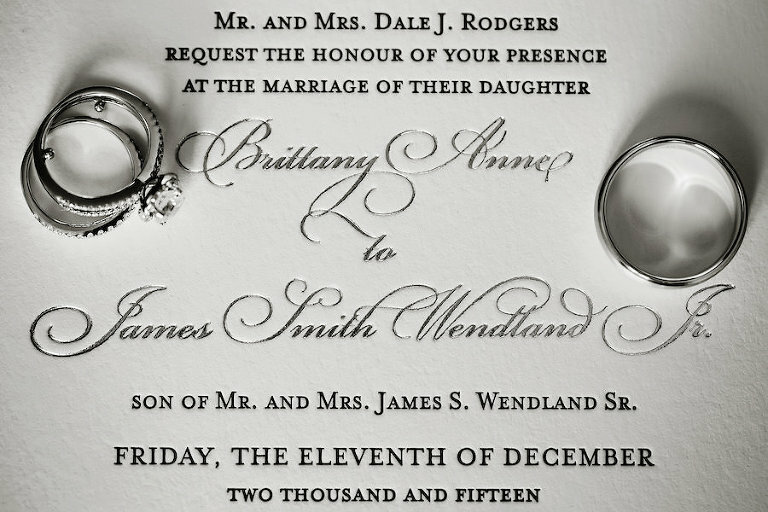 We wanted clean, classic letterpress invitations. We chose A&P Designs because they are a local company, and they had many unique and custom designs to chose from. We were very happy with A&P Designs; they made it so easy to print all of our paper goods so everything matched perfectly (invitation suites, programs, menus, seating charts, and table numbers). On my birthday, April 30, our families met at a beach house on Isle of Palms, South Carolina for James’ family reunion. Once everyone arrived and settled in, they mentioned I still had a few birthday gifts to open. As they were getting the presents ready, I noticed my Dad and James with a birthday cake. My Dad set the cake down, and then I noticed James down on one knee next to me. Completely surprised, I quickly realized that this birthday cake didn’t say “Happy Birthday” but instead read, “Will You Marry Me?” Of course, I happily accepted and we spent the rest of the evening celebrating with our families! Since we had a lot of guests traveling from out-of-town, it was important for us to choose a venue that could accommodate both our ceremony and reception. We love that the Vinoy Renaissance is a historic hotel that has been beautifully upgraded and has beautiful event spaces, great location and an excellent history of service. The attention to detail at the Vinoy was wonderful, and we highly recommend them. Its convenient downtown location, with plenty of restaurants and activities for our guests, made it our perfect choice. What did you look for in a wedding officiant? We wanted an officiant who would appeal to both our families religious beliefs (Catholic and Episcopalian) and someone who could help us create a unique and special ceremony. We hired Michael of [DeArruda Weddings] because he was highly recommended, and we really enjoyed talking to him on our consultation call. We loved working with Michael! He was so helpful during our wedding planning process, making sure to continually check in with us. We wanted a wedding photographer who was professional, fun and had a unique style. We hired Limelight Photography because we love their style, and we heard great things about working with them. Even though we were planning our wedding while living out-of-state, they made sure to consistently communicate with us and make sure we had all the information we needed. Rebecca and Michael [of Limelight Photography] did a great job capturing the candid style photos we wanted, while seamlessly blending into the crowd during our ceremony and reception. We were thrilled with how our wedding photos turned out and so happy we chose them! We didn’t have a specific theme. We wanted our wedding to have a classic, elegant feeling. The most important elements for our wedding were a beautiful venue, delicious food and making sure our guests had a fantastic time. 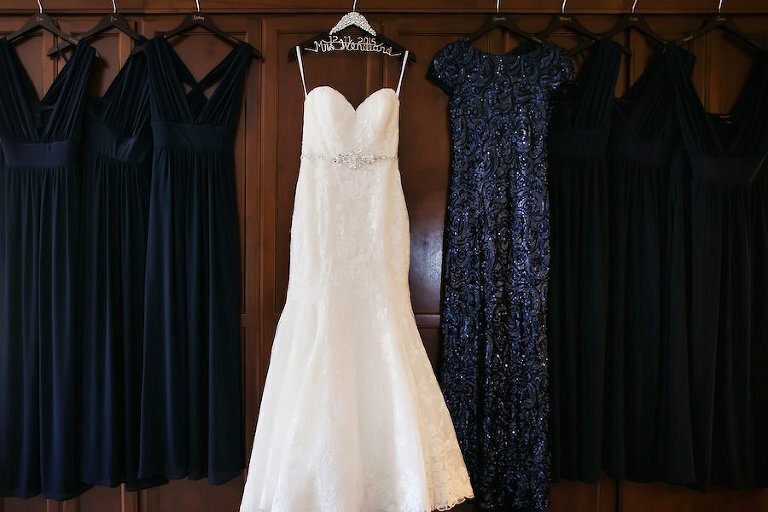 Navy blue, silver and ivory. We wanted classic colors that would complement our venue. Why did you book at photo booth? We wanted a photo booth to add a fun element to our reception. Shutterbooth had an open booth option that can fit more people than the traditional closed photo booth. Take some time to just enjoy being engaged! It’s easy to quickly get wrapped up in wedding planning, so remember to celebrate with your new fiancé before the planning begins.